As teachers, there’s a constant pull toward continuous learning and reflecting on your practices – what strategies can you use to best engage all your students? How do you continue to create effective and creative lesson plans? How can you grow as an educator? 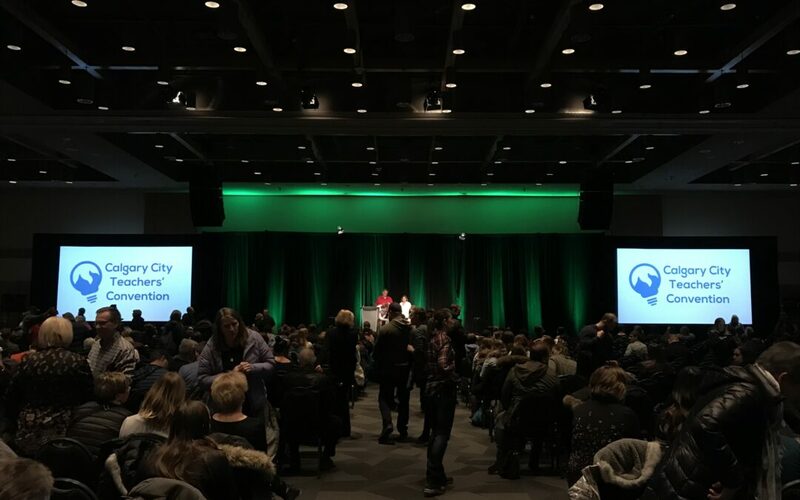 At the 2018 Calgary City Teachers’ Convention (CCTC) in three MindFuel presentations, we discussed just that. We spent the time diving deeper into those topics that questioned how we approach STEM education and how we can provide the most in igniting our students passions? In one session entitled, “Design thinking on Wonderville.org: Bridging worlds and competencies for students,” teachers experienced the powerful learning that happens when design thinking and STEM (science, technology, engineering, and math) are merged. In this session, teachers discovered the importance of Wonderville.org’s blended interdisciplinary approach which addresses both curriculum outcomes and essential competencies. They discovered that the mix of blended learning, design thinking and competencies helps deliver STEM education in an engaging learning experience for students. Teachers were able to work hands-on with a project-based lesson infused with creativity, critical thinking, collaboration, and innovative problem-solving. By the conclusion of the session, teachers better understood the benefits of design thinking, saw how Wonderville.org uses blended learning to deliver engaging student experiences and became better equipped with ideas for how to create a design thinking project for any STEM unit from K-12. The session “How vampires, banana peels, and human hair can fuel STEM education,” allowed teachers to explore how to support their students with the use of creative resources. In this interactive session, educators played some of the games and videos on Wonderville.org and explored project-based lessons that turn “aha moments” into deeper explorations. Using these insights and resources they were able to piece together a unique experience for their students and further explore tools to help them reach diverse learners. Teachers left inspired to teach their next science class and connected with other teachers about how to maximize ed tech using our digital tools for education. In the third session called “PhysicsFuel: Injecting science classrooms with interdisciplinary ideas,” educators explored the research project being conducted by MindFuel and the Schulich School of Engineering, entitled PhysicsFuel. This research fosters essential skills needed for careers in engineering. The objectives of PhysicsFuel research were examined and teachers learned methods for how to better engage more students through changing attitudes towards physics, energizing student enrollment at all levels, increasing diversity through relevancy and engagement of resources and tools, and highlighting STEM career opportunities and post-secondary pathways. The session discussed preliminary findings from the research team and showcased the projects and tools being implemented in middle school and high school classrooms. These examples provided innovative approaches to inspire the teachers in their philosophies for teaching. By the conclusion of the workshop, educators had more insight and felt empowered with ideas to innovate their physics and engineering instruction, and energized to shift student attitudes for greater engagement in STEM. Overall, these sessions allowed teachers to reflect on their practices and be exposed to creative and innovative tools that facilitate positive student engagement. Their confidence in teaching STEM was increased by their encounters with useful resources provided through MindFuel’s educational approach. Thank you to all who attended, it truly made the learning experience exceptional. To further advance your own confidence in STEM teaching techniques and education, visit Wonderville.org, and explore all the games, videos, and lesson plans we offer.